Moses baby pink polka dots. Cotton pique fabric. Ideal place for a girl !. 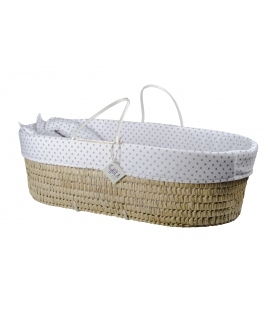 Moses carrycot for babies of palm, homologated according to the norm UNE-EN1466: 2004 with the following measures: 88 x 45 x 30cm. Piqué fabric cover / protector. Anti-choking mattress for bassinet of 4 cm in height. Two cushions: a cushion in the shape of a moon and another cushion in the shape of a star. A blanket to match the chichonera or 100% piqué protector. It is recommended not to let children play unattended in the vicinity of the bassinet. Discontinue use when the child can sit on their own. All parts must always be tight and the screws tightly tightened. The handles and bottom should be periodically checked for any signs of damage or wear. Place the crib away from heat sources.